EN.YEAHMOBI Mobile, Native, Interstitial, Search advertising network details. YeahMobi - it is an Intelligent Mobile Advertising Platform. Their solutions help mobile technology companies reach global growth, monetize inventory and acquire active users. YeahMobi was awarded many times, and receive the title of "Mobile Champion of China Channel Partner" by Google. The numbers speek better than words: they cover 200 countries and regions with over 90 million monthly activations! Once you create an account you will get dedicated experienced Manager who will help you the best. If you have any other questions before sign up, please use the contacts above to contact YeahMobi Team. 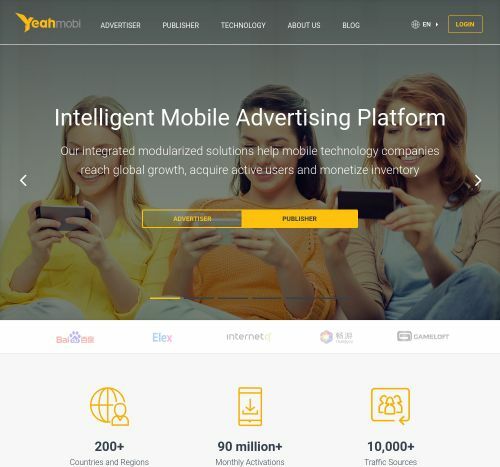 Check also reviews about YeahMobi and the Information section to check their Pricing Models, Advertising Formats and Targeting options. this is a really global company and I am apart of it. I 've just applied for the company and as approved after 7 hours, so approving is very fast.They include app downloads and Pay Per Call. As I see also the same template as GoOffers and OfferMobi and they have mostly the same offers.